It's been a few weeks since I've done a THANK-full Thursday! I thought I'd start off by sharing a picture of the "view" from where I sit at our kitchen table. pictures of my Mamaw and my Mom and the little fallish owlies and the big nut with a squirrel on top (I gave my brother the first one I owned and found this one recently at a thrift store). 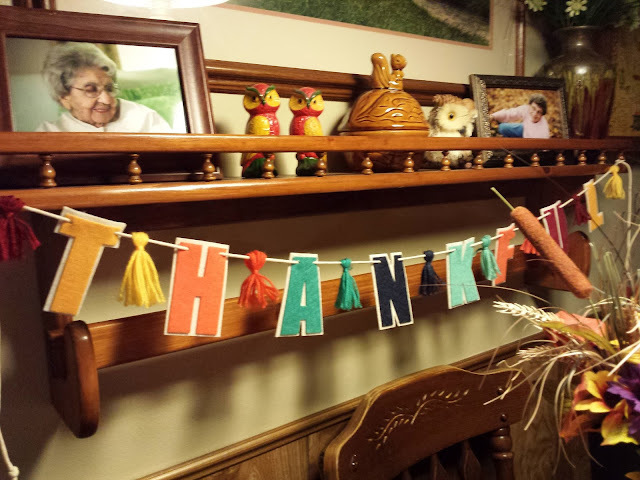 My other fallish owl and the THANKFUL banner. What you can't see.....or smell.....is my awesome pumpkin waffle candle on the table that I burn when I sit there and do my Bible study. Remember last Wednesday when I asked for your favorite fall recipe(s)? Several of my sweet blogging friends obliged me and added a favorite in the comment section of that post. For that I'm very THANK-full and I'm gonna share them here! The first one is from Ms. Terri. Please visit her at Your Friend From Florida. She also has a tab at the top of her blog labeled "Recipes" that you'll want to check out. I just need to get a plane ticket for Florida and spend about a week with this amazing cook! "This is the pumpkin bread my Mom used to make every Thanksgiving. It is moist and delicious. I hope you like it! We sure do!" things to warm the tummy on chilly fall days! it's one of her own paintings! 1 big cans of Italian tomatoes....chop them up. Chicken or Beef broth to make the liquid part of the soup but about 4 to 6 cups worth. 6 to 8 baby potatoes cut into halves or you can also add some cooked pasta instead of the potatoes for a very filling meal. 1 bay leaf, some pepper, some dried basil. 1 tsp of thyme and 1 tsp marjoram though you won't miss them if you don't add them. If you like add a big beef bone for more nutrition and flavor or add a pound of cut up beef. Everything into a big pot and cook on medium heat until done. That's all there is to it. Adjust the heat to keep it from burning and stir often. And, this one sounds sooooo good because I ♥ sauerkraut. 1 bay leaf 2 pounds of sauerkraut well drained and rinsed and chopped up coarsely. 1 and 1/4 cup of bone broth or plain water, but bone broth will add good flavor. You can now buy it in the supermarket where the packaged broths are sold. 2 big sweet yellow onions chopped up. Saute the onion in the oil over a slow heat. Add the beef chunks, caraway and bay leaf and brown the meat. Now add the paprika and pour in the water quickly as paprika can burn very fast! Cook until the beef is done. Add the coarsely chopped sauerkraut. You chop it since you don't want long strings of it in the stew. Serve in a bowl with dollops of sour cream. Have it with crusty hot bread and butter and a salad or vegetable on the side. And, last but certainly not least is a recipe that Ms. Dianna left for pumpkin fudge! Ms. Dianna blogs at Forgiven where her writings are as if she's writing in her journal. It makes me feel like she's sharing her most personal thoughts from her heart. 1. Line a 9-inch square pan with aluminum foil. Spray with nonstick spray. 2. Stir together first 6 ingredients in a 3 1/2- quart saucepan over medium-high heat, and cook, stirring constantly, until a candy thermometer registers 234° (soft ball stage) or for about 12 minutes. 3. Once mixture reaches 234°, remove from heat and quickly stir in the white chocolate, marshmallow creme, pecans (if using) and vanilla until well blended. 4. Pour into the prepared pan. Let stand 2 hours or until completely cool; cut fudge into squares. THANKS again, sweet Ladies, for sharing. HOPE everybody has a great day! Yum, all keepers, smiles. I have missed you, friend and I just love your Thankful sign you have. Have a beautiful day, Deb. WOW, so many good recipes. I have found that 99% of all my blog friends are good cooks....me, not so much! lol Thanks for sharing and have a great day. What a lovely view from your kitchen table - and that candle must smell deLICIOUSly! Love your shelf and the lovely things on it. I'd love to smell your candle. I love your shelf and all the lovely things gracing it! Thanks for featuring my mom's pumpkin bread recipe! I made it last Friday and both loaves are gone already! The veggie soup sounds yummy! Love your view from the kitchen table, very warm and inviting. WoW, those are some great recipes and they're going in my recipe folder. Yes, this vintage lady said folder....but I still have my recipe box too! !